If you’re dealing with a nagging injury or ongoing condition, our exercise rehab services may be the perfect fit for you. Access a tailored, personalized and science-based approach to achieving specific results, like building strength, improving mobility and decreasing pain. With our exercise rehab program our goal is to get your body moving with ease and minimize the challenges found in everyday activities. At Symmetrix Exercise and Rehab we are a staff of trained and experienced kinesiologists who believe in employing a science-based approach to exercise rehabilitation. We work independently or alongside your health team to help you overcome your injuries and stay healthier, longer. Our clients love getting stronger, reducing pain and getting back to the activities they enjoy and we love helping them get there. Since 1992 our expert staff of kinesiologists have helped hundreds of exercise rehab clients to reach their goals. We apply evidence-backed knowledge and a focus on technique to help clients overcome injury and prevent future flare ups in long-term conditions. Our top priority is helping our clients to get and stay active. We want to make it easy for you to get the information and treatment you need to get started on your wellness journey right from your initial assessment. We work directly with your healthcare team to create a treatment plan tailored specifically to you. 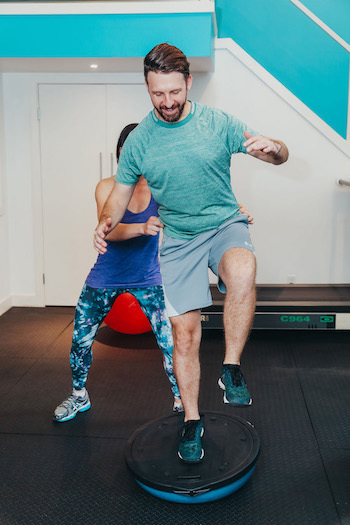 Enjoy working one-on-one with one of our trained kinesiologists at our private studio to develop a personalized treatment plan that fits your schedule. Our goal is to assist you in developing healthy routines that will improve your wellbeing for the long-term. Best of all our studio is conveniently located in Yaletown on Seymour at Davie. These are the most commonly asked questions about Exercise Rehab. If you don’t see your question on this list, please feel free to contact us! How do I start with exercise rehab? All you have to do to get started with exercise rehab is simply give us a call to set up your initial assessment. While it is helpful to have a referral from your healthcare team, you can start the program with or without a doctor or physiotherapist’s recommendation. What happens at the first exercise rehab session? The first appointment is an assessment. Your kinesiologist will ask you a series of questions about your body, your medical history, past injuries and your function. Armed with this knowledge they will then assess your range of motion (flexibility), strength, and posture and may have time to prescribe some exercises for you. These assessments typically last approximately 1.5 hours. What’s the difference between kinesiology and physiotherapy? Kinesiology is an active treatment, meaning you spend your session actively moving your muscles. In comparison, physiotherapy relies on more hands-on passive forms of treatment. Many people use physiotherapy for more acute conditions and injuries, while kinesiology is more frequently employed as a form of therapy for longterm injury recovery and prevention. Find out more here. What should I wear or bring to an exercise rehab assessment or session? Wear comfortable clothes for exercising and closed toe shoes. We also recommended bringing a refillable water bottle. Yes, we are covered by the BC Association of Kinesiologists as well as covered for commercial general liability. Our space is covered by commercial general liability insurance. How long are exercise rehab session? Our exercise rehab sessions are typically 1 hour long spent one-on-one with one of our trained kinesiologists. How much does exercise rehab cost? Clients pay $80 per session + GST. We also offer packages at a reduced rate if you are looking to develop a longer term program with us.